The first step towards a diagnosis is to talk to your doctor about your concerns. It is a good idea to take a close family member or friend along to help provide the doctor with all the information they need. It is also a good idea to take along a list of the memory and thinking changes that have been concerning you, including when you first noticed them and how often you notice them. You should also take a list of the medications you are taking or take your medications with you. Your doctor may assess you and/or may refer you to a specialist such as a geriatrician (a specialist in illnesses and disabilities in older people), a neurologist (a specialist in disorders of the brain and nerves), or a psychiatrist (a specialist in disorders of emotion and behaviour). The doctor usually spends some time discussing your medical history and gathering information about your changes in memory and thinking. The symptoms of dementia can be due to a number of other possible causes, such as vitamin deficiency, infection, metabolic disorders and side effects from drugs. These other causes are often easily treated. Therefore, an early step in diagnosing dementia is to rule out these causes through a physical examination, blood tests and urine tests. Urine tests to investigate infection. Cognitive tests are used to measure and evaluate cognitive, or ‘thinking’, functions such as memory, concentration, visual-spatial awareness, problem solving, counting and language skills. Most doctors use short cognitive screening tests when assessing these functions. If more detailed testing is required you will be referred to a neuropsychologist – a psychologist specialising in the assessment and measurement of cognitive function. Cognitive tests are vital in the diagnosis of dementia and are often used to differentiate between types of dementia. They can also be used to assess mood and may help diagnose depression, which can cause symptoms similar to those of dementia. Special arrangements can be made for testing people whose first language is not English or who have communication difficulties. Your doctor can give you advice about this. This test is usually conducted by your doctor or specialist in their office and takes around 5 minutes to complete. The MMSE is the most common test for the screening of dementia. It assesses skills such as reading, writing, orientation and short-term memory. This 11-part test is more thorough than the MMSE and can be used for people with mild symptoms. It is considered the best brief examination for memory and language skills. It takes around 30 minutes and is usually conducted by a specialist in their office, or you may be referred to a psychologist for the test. This involves a number of very sensitive tests administered by a neuropsychologist (a psychologist who has been trained in the assessment of dementia and other disorders of the brain). A typical testing session will take at least 2 hours and may be conducted over more than one visit. A variety of tests will be used and may include tests of memory such as recall of a paragraph, tests of the ability to copy drawings or figures and tests of reasoning and comprehension. This technique involves taking many X-rays from different angles in a very short period of time. These images are then used to create a 3-dimensional image of the brain. CT scans are mainly used to rule out other causes of dementia such as stroke, brain tumour, multiple sclerosis or haemorrhage. They can show certain changes that are characteristic of Alzheimer's disease or other causes of dementia. This technique uses powerful magnets and radiowaves to produce very clear 3-dimensional images of the brain. Currently MRI is the radiological test of choice. As well as ruling out treatable causes of dementia, MRI can reveal patterns of brain tissue loss, which can be used to discriminate between different forms of dementia such as Alzheimer’s disease and frontotemporal dementia. In both of these tests, a small amount of radioactive material is injected into the patient and detectors in the scanner detect emissions from the brain. PET provides visual images of activity in the brain. SPECT is used to measure blood flow to various regions of the brain. Some questions you may wish to ask you doctor regarding tests used in diagnosing dementia. What tests will be conducted? Who will be performing the tests and how long will it take? Should I prepare for the tests in any way? Will any of the tests involve pain or discomfort? Will there be any cost involved? What follow-up will be necessary and who will follow up? How will I be informed of the test results and the diagnosis? Obtaining an early and accurate diagnosis can improve the quality of life for people with dementia. Talk to your doctor about treatment and ongoing assessment. 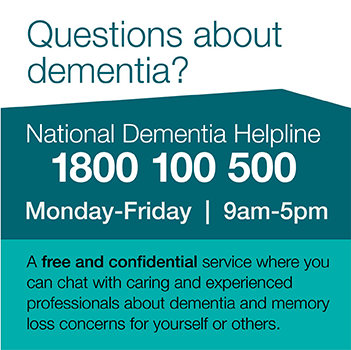 Support and information is available through the National Dementia Helpline on 1800 100 500. Thanks to Associate Professor David Ames for reviewing this material.